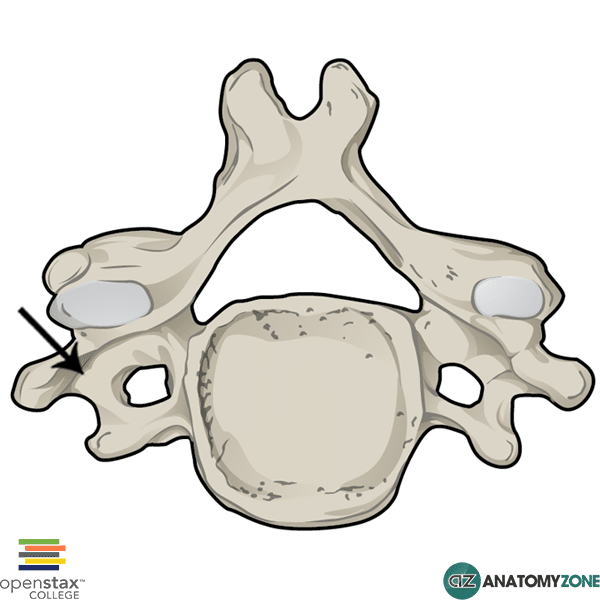 The structure indicated is the transverse process of the vertebra. The transverse processes of the vertebrae extend from the vertebral arch at the point where the pedicles meet the lamina, and lie in between the superior and inferior articular processes. A facet on the transverse processes of the thoracic vertebrae serves as the point of articulation for the tubercles of the rib. In addition, the thoracic vertebra have superior and inferior costal facets on their vertebral bodies which serve as points of articulation for the heads of the ribs. The inferior costal facet articulates with the head of the rib below, the superior costal facet articulates with the rib of its own level. For example, rib 2 articulates with the inferior costal facet of vertebra T1, and the superior costal facet of vertebra T2.